Approx 20" long including pendant, pendant is 2" x 1 1/4"
I have made this necklace with a beautifully carved piece of golden bicolor jade and a double strand of Baroque pearls and clear golden Imperial topaz nuggets. 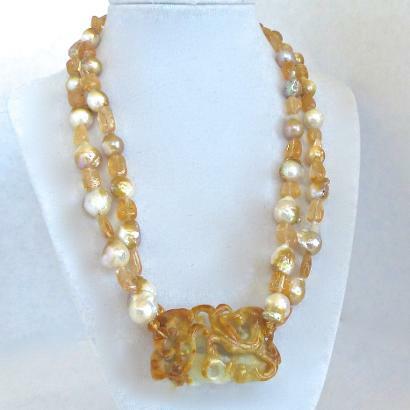 The topaz picks up the golden hues in these beautiful irregular shaped pearls. the jade is a pale milky green and deep golden color. The artist that carved it has used the two colors to emphasize the carved dragon which is golden and stands out against the pale green. The golden color is picked up by the golden topaz. The jade measures 2” wide by 1 1/4” high. The pearls are approximately 10 mm in diameter but each pearl is slightly different. The inner strand 917 3/4”0 nestles inside the outer strand (18 3/4”) and is finished with a large 18k gold vermeil clasp. This is a one of a kind necklace. Pearls are the iridescent substance that forms the lining of the shells of some fresh water and some salt-water mollusks. It is a secretion made by the layering the animal's mantle. This makes it light reacting which gives the pearl its sheen. The pearl has been known as a stone of sincerity. Baroque pearls are irregular in shape often with a variety of colors in each pearl. Since each pearl is unique they make interesting and unique pieces of jewelry. They were highly prized during the Renaissance because of their natural forms. Pearls are the birthstone for June. Topaz is the birthstone for November. Imperial topaz is a deep golden yellow. It was believed to prevent death when worn during the Middle Ages. The Egyptians believed wearing it would prevent injuries.